In the 1960s the UK Government, through the Central Office of Information (COI), produced a number of films for distribution throughout the commonwealth. 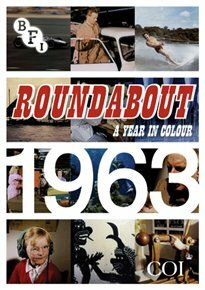 Designed to promote British industry and values abroad, Roundabout was one of the most popular of these cine-magazines, with its colourful selection of topical stories for the Asian market. The BFI has collected all the Roundabout films from 1963 to produce a unique and fascinating glimpse of Britain and its place in the world 50 years ago.Consisting of 11 globetrotting films, highlights include a visit to the Royal Mint, a tour of a rubber-tree plantation in Southeast Asia, a trip around a British doll factory and a look at modern architecture in London, Jakarta and Saigon.